Introducing the brand new BowVy Cutter! It cuts and seals in one step! Please watch our videos for proper use. This is a filament cutting tool, not a knife. See tips and techniques here! It’s a hand held, cordless, hot filament cutting tool with interchangeable tips! It includes the 1.5” and 3” V tips. Great for hair accessories, gift baskets, home decorations, weddings, cheer bows, costumes and crafts. It’s precise! It cuts and seals a perfect V on most polyester ribbon and fabric. No guesswork = less stress, more symmetry. It’s multifunctional! In addition to the V shape, you can turn the tip sideways to make straight cuts, angled cuts, patterns and shapes. It improves on safety! It’s got a double safety ON switch and heat button to activate it. Also eliminates the dangers of a cord getting snagged on heated “constant on” tools. It’s FAST! It heats up in 3 second and cools in about the same. It’s ready to use when you need it. Limited first run quantities are in stock and will ship January 26th, back orders will ship at the end of April. The bows you make will be easier, faster, more beautifully perfect. The learning curve will go from months to minutes. You will be able to snap out a bow for your daughter, a friend, your shoes, a purse, a gift, curtain tiebacks, floral arrangements, scrapbooks, greeting cards or just for the sheer fact that you too can be a Brilliant Bowmaker! Classic Bows are very tailored bows, and lay flat to the head. They are very durable, hold their shape well and are great for attaching to clothing. This stylish bow is great for beginners to start with, and the templates make it easy for experienced bowmakers to work faster and more consistently. Several options for each step in the bow making process make it easy for any level of crafter to excel. Mixing up the 7 different, detailed techniques will keep this classic bow eye catching and refreshing. 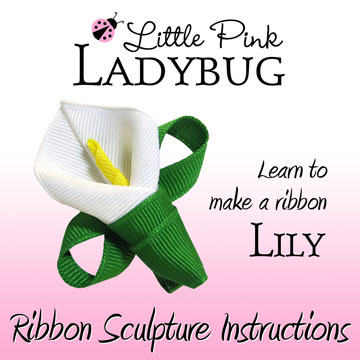 Kit includes 8 plastic templates in Infant, Small, M, L, XL, 5", 6", and 7" sizes (makes bows 1.25" through 7"), spiral bound instruction and idea manual, bow stapler (optional assembly method) and refills. The packaging for these items may vary from retail packages shown in photo. Shipping is USPS Priority or Priority International. No items will ship until extra shipping invoices are paid. US residents will receive a shipping notice from PayPal when your item is shipped. International shipments are manually taken to the PO. Please contact us through the website for wholesale inquiries. The book includes 7 techniques including the Basic fold, Stacking, Layering, Criss cross, Long tails, Cheer bows, Stacked with twists and Stacked with tags. It also covers supplies, tools, hardware, cutting and sealing ribbon and more, and comes with a great chart for choosing the size bow, ribbon width and template to use. These templates are all about giving you choices. For each step YOU can choose the method you want to use, so you can craft the way you are comfortable working. 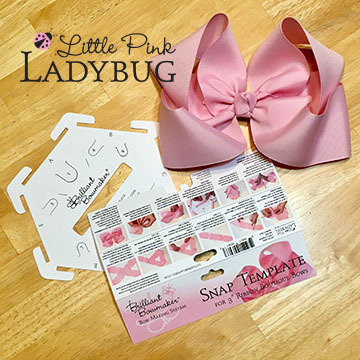 The 3" Snap Template is perfect for making large twisted boutique bows with 3" wide ribbon. Designed with ribbon holding tabs to keep everything firmly in place for a picture perfect bow! Includes folded header card with photo instructions. More photos and detailed instructions (coming soon!) 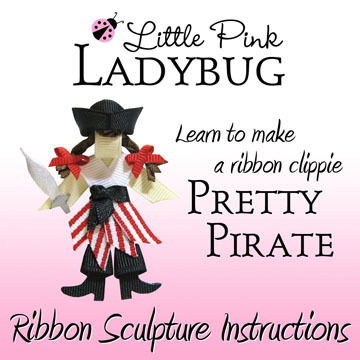 can be printed from the website here and videos on our LittlePinkLadybug Youtube channel.